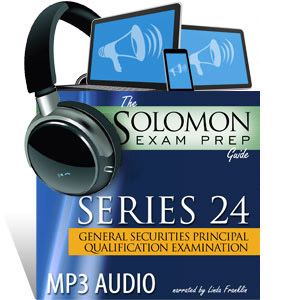 This 16-hour audio recording of "The Solomon Exam Prep Guide to the Series 24--3rd Edition" will give you the content of this invaluable and enjoyable study guide in an audio format. After hearing the book’s well-written content, you will be even more prepared to tackle the Series 24 exam with confidence! The Series 24 audiobook is a great companion to the Series 24 Online Exam Simulator, the industry-leading online testing program that ensures you are learning and retaining the information. After multiple failed attempts at the Series 6, I felt somewhat defeated. I reached out to Solomon for guidance and I was more than impressed with the response I received. The study material was outstanding and the program structure is truly designed to help you pass! Jeremy Solomon was truly my biggest fan and I can't thank him enough for his help! Solomon is by far the best company out there for test preparation; don't waste any more money on the others this is all you will need to pass!